Did you know we offer free and supported courses in the community to those who have difficulty accessing learning opportunities? Outreach courses provide learning opportunities towards a brighter future for those who may find it difficult to access learning. Subjects we offer include Employability, Arts and Crafts, Exercise to Music, Maths, and IT*, though we are open to discussing other subject options. Our courses are set up in cooperation with our partners to ensure that all learners' needs are met. Some of our partnerships include Probation, The Job Centre, York Road Project, Vaughan House, Kennedy Scott, Catalyst, and The Welcome Project. Peter first engaged with our team at a homeless hostel in Guildford. He had limited Maths ability, and after some basic Maths and English tuition, Peter went onto a pre-GCSE Maths course in one of our centres. Peter thought: "I can crack this!". He said: "I want to get out of the rut, get up and make something of myself and I wish I had done this before." 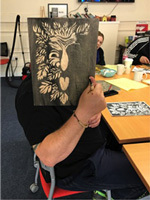 Wood Carve Prints by learners at York Road Project, Woking. 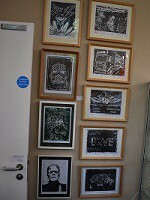 The work received the award 'Best Collection of Work Community Projects' at our End-of-Year Exhibition.